Today I opened my own Etsy shop! After searching for druzy agate necklaces at a reasonable price (which turned out to be impossible) I took matters into my own hands to create my own version of these delicate necklaces that I saw all over the runway. 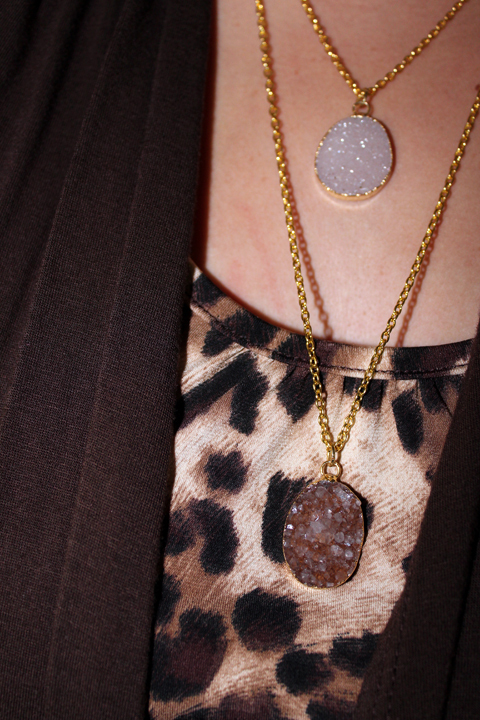 Currently my line features druzy agates in a variety of neutral tones and a couple amethyst clusters ( both will be perfect for fall). P.S. most of the necklaces are on a 24 inch chain that requires no clasp if you would like a stone on a 17 inch chain with a lobster claw closure please buy your necklace and then send me an email with you special chain request! Oh la la I love the 24k gold framed druzy agate. So exciting Erica! such pretty jewlery!!! I love it! Congrats! The necklaces are so pretty, I'm going to check them out now! Yay congrats! These are SO pretty! 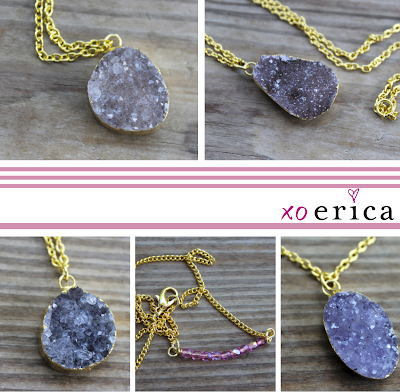 I love the druzy look. I have a ring that's similar to the amethyst one. Congrats! They are beautiful! LOVE!